Blog Google AdWords: What should you do with your AdWords account on a daily basis? If you want to maximize your profits from PPC, here are 8 essential daily activities you need to complete. Many advertisers get into the habit of analyzing their Search Terms Report on a daily basis. 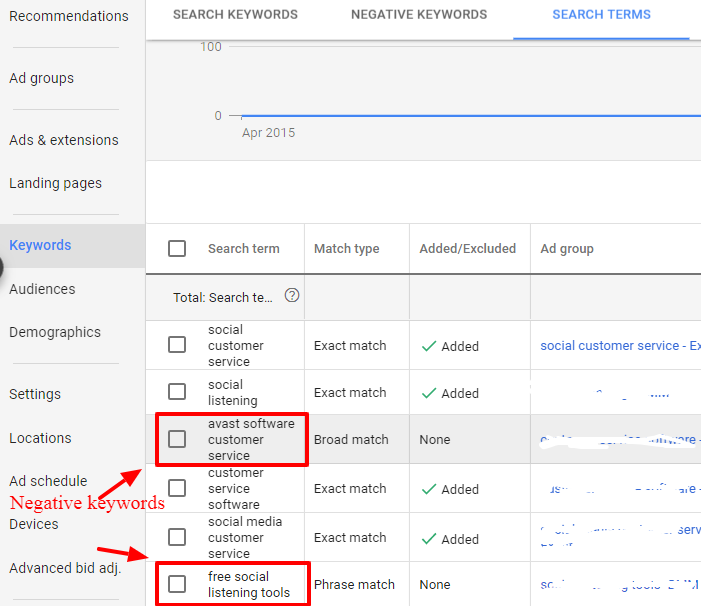 This shows you the list of queries your ads have served and it can help you detect some trouble spots. 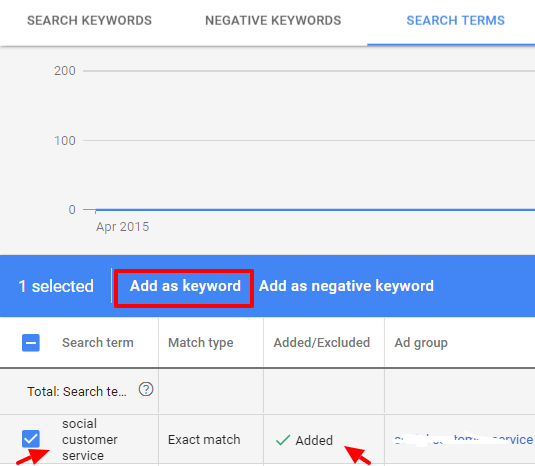 First, check for queries you don’t want your ad to show against under Match Type, Broad match. For instance, if you sell customer service software, make sure your ad isn’t showing for “avast software customer service” or “free social listening tools” queries, as these queries aren’t a match to your services and clicks on these keywords are costing you money. When you see these types of queries, set these terms as negative keywords. Second, check to see if you have high converting queries in your keyword list. If so, you should consider adding them and setting precise bids on these keywords. Finally, check to see if there are unexpected or new queries that trigger your ad. It’s difficult to predict all the words people use to search for your services in the Google search result. Checking the Search Terms Report can help you identify if there are other categories of terms where you need to be advertising. In most cases, CTR has the greatest impact on an AdWords campaigns. A high CTR leads to higher quality scores, which helps to reduce your Cost Per Click (CPC), increase search volume and it means that your ad is generating more interest. This is true across all Google Properties including; Search, Display, YouTube and Gmail Ads. It also impacts your impressions, how often your ads show up and will increase your conversion rates. 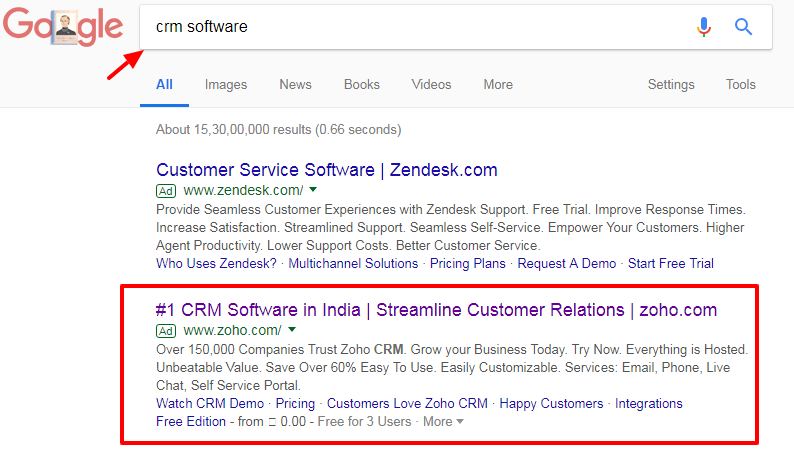 Here’s an example of a campaign created to advertise Zoho, a leader in Customer Relationship Management (CRM) software. 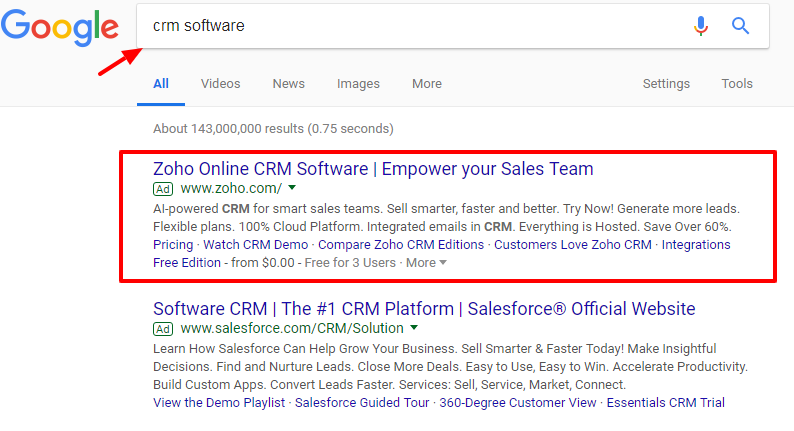 For the keyword “CRM Software,” the Zoho ads below show variations of ad copy from the header to the messaging, ad extensions and use of bold font. Ensure that the keyword targets for all the ads in your ad groups feature boldly highlighted text. Your CTR also acts as a competitor in the ad space. If the CTR changes radically it means that a new or key competitor has just left the ad space. 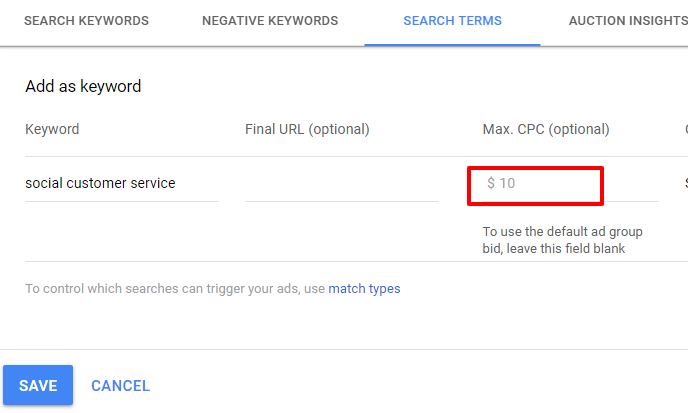 CPC is a variable in the Google Adwords algorithm. A “click” on one of your Google Ads represents a visit and an engagement with your company that indicates interest in what you’re offering. Change in level of competition. Improvements in ad relevance, CTR & quality score of the landing page. Seasonality also can affect CPC significantly. Cost Per Conversion is the calculation for how much it will cost to achieve an action or conversion. A conversion basically is the goal you’ve set for your campaigns. For instance, when a customer clicks on your ad, your ultimate goal might be to have them sign up for an email newsletter or it might be to have a customer purchase a product or call for a service. The profit is the difference between your Revenue Per Conversion and Cost Per Conversion. It helps in opening new doors and giving options as a marketer. When your CPC drops, your campaigns become more profitable. Remember, though, your CPC is affected by multiple parts of conversion funnel. If you understand CPC, it will help you to think beyond the bounds of AdWords. You also must be thinking about the effectiveness of your landing pages and your overall User Experience for your AdWords optimization. Landing Page Experience (quality of web page). Keyword and Ad Copy Relevance. Although it’s impossible to define which factors carry the more important weight at any given time (we were not even told this at Google), we suggest you optimize for a strong CTR. When many people click on your ad, it’s a sign to Google that your ad is relevant and helpful. Click the keywords tab in campaign. Now click the column button and choose Modify. Click on the Quality score. Using this option, you can gain insight as to which device is performing better in your campaigns and decide whether to lessen the bid for an underperforming device or to increase the bid for best performance. This tool assists you to see every domain in the same Google ad auctions at the Campaign, Ad Group, and Keyword level. Furthermore, it provides you with information about how your ads are performing in relation to the other advertisers’ domains. To use this tool, simply click on the Campaigns or Ad Groups tabs on the left navigation bar. You will see Auction Insights on the top of the page. AdWords geographic reports provide you with data by location. 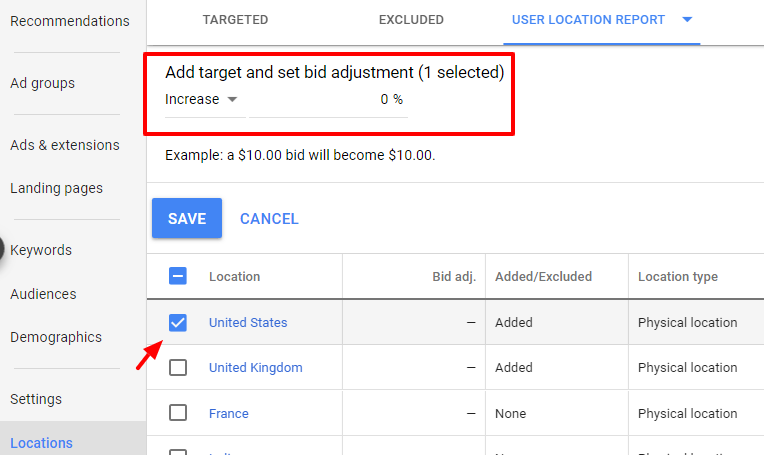 This can help you to optimize campaigns by the best or worst performing areas; creating new bid modifiers for specific cities or examining the performance of current targets. This information is crucial to identify growth opportunity. You will find this data in the Locations tab. You can see every targeted location, campaign, and bid adjustment along with other desired metrics. Bottom line: PPC campaigns are excellent for generating high quality visitors that can then be turned into customers, but if you’re not performing daily reviews of your campaigns, a small problem quickly can snowball into a crisis.